Normandie (French Line) may be taken as a typical mammoth transatlantic vessel (top left). Since all these silhouettes are approximately to scale, the enormous size of Normandie can be appreciated. Her 79,250 gross tons and 160,000 hp are impressive compared with the Fast Passenger Vessel, the Cunard White Star Georgic. She, too, is a transatlantic ship, but of 20,000 hp and nearly 28,000 gross tons. The graceful proportions of the Cruising Liner Arandora Star (Blue Star Line) account for only 14,694 gross tons. Arandora Star was originally designed as a meat-carrying vessel and later converted for cruising. 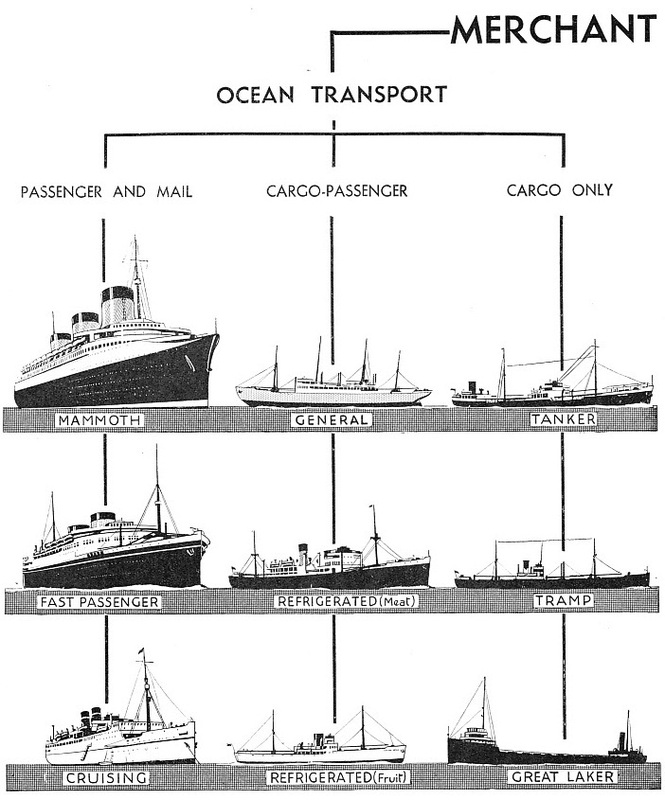 The cargo and passenger vessels have similar dimensions. The General Cargo Ship illustrated, which has a hull of specially patented design, is of the type with a gross tonnage exceeding 8,400 and a horse-power of nearly 8,000. The Refrigerated Meat Ship has a gross tonnage of approximately 8,500 and a total of 1,500 h.p., with twin screws. The Fruit Ship illustrated is remarkable for her speed, having over 16 knots, although her tonnage approximates only 3,600 gross, with engines of nearly 4,000 h.p. The Tanker illustrated here has a carrying capacity of about 10,000 tons and nearly 3,000 hp. The modern Tramp carries 9,000 tons and has a speed of II knots, with about 2,000 h.p. on a single screw. The Great Laker does not belong to ocean transport, except by reason of size and power. This ship type operates as a cargo vessel on the enormous freshwater areas of North America, and has a length of 579 ft, a carrying capacity of about 12,000 tons, a single screw, and not less than 3,000 hp. Occasionally Great Lakers sail out into the open sea. 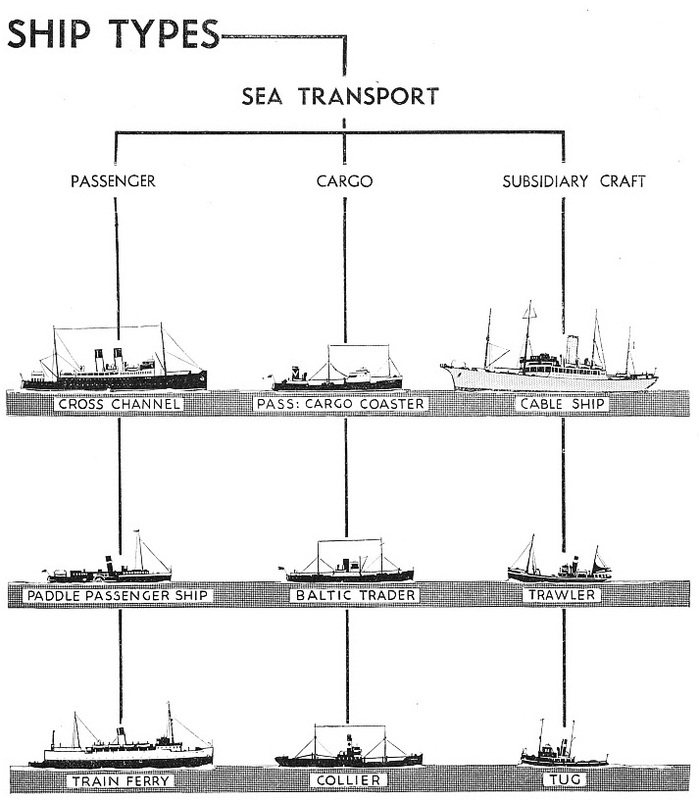 Sea Transport types in the passenger category include Cross-Channel Ships, Paddle Passenger Vessels and Train Ferries. The Cross-Channel Ship is the passenger and mail liner of the narrow seas, and has as much as 15,000 hp in a hull under 400 ft long and with a gross tonnage of between 3,000 and 4,000. The Paddle Passenger Vessel is a familiar feature of the Clyde and of many seaside resorts. In size a vessel of this type is between the Cross-Channel Ship and Train Ferry ; she has a horse-power of approximately 1,000. The Passenger Cargo Coaster carries, in addition to a number of passengers in luxurious quarters, nearly 1,500 tons of cargo. Such vessels have twin screws driven by engines of 1,250 hp, and are comparatively a new ship type. The Collier carries cargoes from the British coal-fields to gas works on the Thames and to ports in Northern Europe, Spain and the Mediterranean, sometimes running back light and at other times carrying pit-props or coke. The Baltic Trader works from the Swedish ports. She has a special stem for ice-breaking. Cable Ships are large seaworthy vessels, yacht-like in appearance, and may equal in size the large cargo liners. Cable Ships are equipped with ingenious machinery for hauling up the cable from the ocean bed when repairs are necessary. Special winches are provided so that the cable shall be paid out evenly throughout the vessel’s voyage from shore to shore. Tanks are provided in which the cable is stored and from which it is withdrawn by special apparatus. Cable Ships are included in subsidiary transport because by their work the world’s shipping business is assisted. The Trawler illustrated is capable of travelling as far north as Iceland. She has about 800 hp. The Tug, an important unit of subsidiary transport, is typical of vessels employed for docking and undocking ships. She is a sturdy vessel of about 1,000 hp. Large ships need the assistance of tugs at every port.